I receive regularly websites of new residential developments. 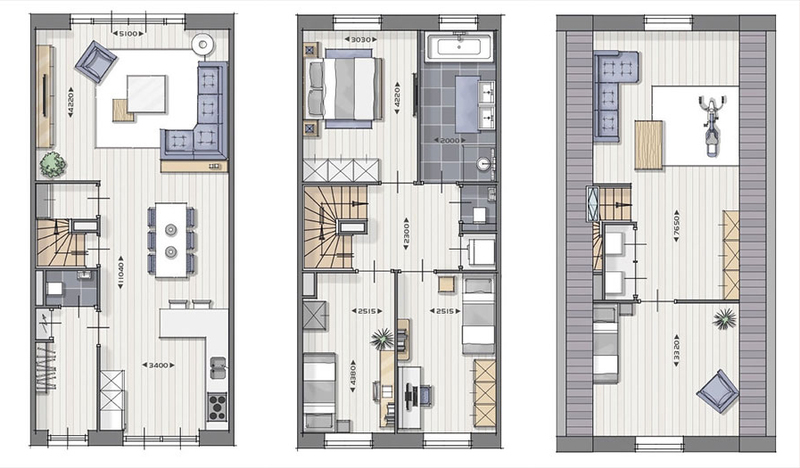 Below are the floor plans of one of these projects. It stood out to me because of the exterior renders that I rather liked, so I was keen to discover more. I found the floor plans to be close, but not quite there! From the disclaimer available on the website, I understand these are just suggestions and not “actual plans” as these can, and will be personalized upon buying the property. However, most people haven’t spent years studying and drawing floor plans, so this is what they will use as points of reference for available options. Thus, this is what I’ll be analyzing. • Talking about closets, let’s look at the two secondary bedrooms from the first floor. One has 3 closets while the other has only one. How does that work? • I’ve noticed this trend of using the attic to place sports equipment, and in all honestly I find it confusing. If you’ve packed the other two floors so tightly and need so much space, how come you have the option to use half a floor (at times the full attic) as a gym? I don’t have anything against the idea of a gym, I just feel the example is not representative for the average use of that particular space. Most of this type of residences that I have visited so far, ended up using the attic space as a storage/dressing/extra office space. What if the master bedroom was in the attic? Plenty of space for a dressing. Toss in an en suite, maybe even an office, or the guest room. Put the kids all together on the first floor. If not enough of them, turn one of the rooms into a common space where they can have all sorts of activities which, as an added bonus, will allow the living room to be a much more relaxed space. Leave the washing machine on this floor as this is where most laundry will come from, but allow more space for laundry to be stored in. • I like this version better when it comes to the bedrooms. I still don’t like however, having to access the living room through the kitchen. And I do think the kitchen could benefit from a completely different layout. • Also, one of the things I don’t really understand is the separation of the living room area through the placement of the couch with the back at the rest of the floor. Though there are exceptions, most people like communicating spaces and being able to talk to people without having to turn around all the time. So why have an open floor plan if people will have to strain their necks? • Lastly, if you do have a piano, show it off! Make it a feature! Don’t just glue it on a wall as in “Well, that’s where it fitted!”. And turn the couch around so that people can actually see the person playing. A little bit of recognition is good for one’s self esteem! • The aforementioned issues of the bedrooms, storage and kitchen still stand. I mention here, once again, the layout of the kitchen. The three main elements of the space, sink, stove and fridge work closely together. We tend to get things out of the fridge, pass them through the sink and place them into a pot on the stove. The ideal layout would be a triangle with large enough sides to allow one to move freely, yet not so large as to have to walk too far while carrying delicate items. With that being said, the location of the fridge is definitely off. • Same as above, with one more mention. There is a large beautiful table for six right by the kitchen. Yet, right next to it there is a cramped bar element with two chairs that can easily block the circulation in the space. If the room was big enough, the two elements would not collide, but this space is not large enough. You want both the bar and the table? Sure! Change the layout of the kitchen and it can all work much better. This version cramps the dining area while wasting space in the kitchen. • The ground floor space is beautifully open and communicative. However, the layout of the kitchen, while nice for watching outside, will force its users to keep their back at the rest of the floor. I would thus suggest leaving the line at the wall with the window simple, removing the short side of the L, and adding an island. The island will add counter space, provide communication with the rest of the space and the option of a bar. • A little bit of nitpicking here, I like the combo kitchen-dining table. I would however make them out of the same material so that they feel like one element instead of just two pieces placed one next to the other. • I like the entrance through the middle of the floor. It allows for a much more relaxed and elegant entrance. I do however dislike the placement of the dining table. No matter what you do, four people will, at any point in time, look over their shoulders. They will either try to look out the window or towards the living room where the rest of the party will be having their fun. All this can be easily sorted by rotating the table with 90 degrees. • I also don’t appreciate the layout of the kitchen. True, it is large and generous, but the stove is so far from the fridge that you need to be quite fast on your feet and most likely end up with a muscle ache and a pinch of frustration. • We have all this amazing space on the top floor, where we created a secondary living space. Yet, the washing machine and dryer are out in the open. Seriously? Couldn’t they have a space of their own, where the sight of a laundry basked would not make a host cringe? There is plenty of space! • I love how all the bedrooms on the first floor pale in comparison to the one in the attic. Not even the master bedroom can come close. Really? Who gets to sleep there? Now, let’s see! This layout gives me the feeling it was done late and somewhat in a hurry, in order to make sure there is a second option. • The TV in the living room is not aligned with couch area so watching it is bound to make a physio-therapist have plenty of work. The piano can’t really be admired. And the armchair sitting right in the middle of the circulation makes one slalom through the space. All images courtesy of the website of the project as seen on 07/2018.